By the middle of the 17th century the Realm of Sweden had reached its greatest territorial extent and was one of the great powers of Europe. Sweden then included Finland and Estonia along with parts of modern Russia, Poland, Germany and Latvia. The Swedes sought to expand their influence by creating an agricultural (tobacco) and fur-trading colony to bypass French and English merchants. The Swedish West India Company began with a mandate to establish colonies between Florida and Newfoundland for the purposes of trade, particularly concentrated in the Delaware river. Its chartered included Swedish, Dutch, and German stockholders and led by directors of the New Sweden Company, including Samuel Blommaert. The Company sponsored 11 expeditions made up of 14 separate voyages (two did not survive) to Delaware between 1638 and 1655. The first Swedish expedition to North America embarked from the port of Gothenburg in late 1637. It was organized and overseen by Clas Fleming, a Swedish Admiral from Finland. A Dutchman, Samuel Blommaert, assisted the fitting-out and appointed Peter Minuit (the former Governor of New Amsterdam) to lead the expedition. The members of the expedition, aboard the ships Fogel Grip and Kalmar Nyckel, sailed into Delaware Bay, which lay within the territory claimed by the Dutch, passing Cape May and Cape Henlopen in late March 1638, and anchored at a rocky point on the Minquas Kill that is known today as Swedes’ Landing on March 29, 1638. They built a fort on the present site of the city of Wilmington, which they named Fort Christina, after Queen Christina of Sweden. In the following years, 600 Swedes and Finns, the latter group mainly Forest Finns from central Sweden, and also a number of Dutchmen and Germans in Swedish service, settled in the area. Peter Minuit was to become the first governor of the newly established colony of New Sweden. Having been the Director of the Dutch West India Company, and the predecessor of then-Director William Kieft, Minuit knew the status of the lands on either side of the Delaware River at that time. He knew that the Dutch had established deeds for the lands east of the river (New Jersey), but not for the lands to the west (Maryland, Delaware, and Pennsylvania). Minuit made good on his appointment by landing on the west bank of the river and gathered the sachems of the local Delaware tribe. Sachems of the Susquehannocks were also present. They held a conclave in his cabin on the Kalmar Nyckel, and he persuaded the sachems to sign deeds he had prepared for the purpose to solve any issue with the Dutch. The Swedes claimed the section of land purchased included the land on the west side of the South River from just below the Schuylkill, in other words, today’s Philadelphia, Pennsylvania, southeastern Pennsylvania, Delaware, and coastal Maryland. The Delaware sachem Mattahoon, who was one of the participants, later stated that only as much land as was contained within an area marked by “six trees” was purchased and that the rest of the land occupied by the Swedes was stolen. Director Willem Kieft objected to the landing of the Swedes, but Minuit ignored him, since he knew that the Dutch were militarily impotent at the moment. Minuit finished Fort Christina during 1638, then departed for Stockholm for a second group. He made a side trip to the Caribbean to pick up a shipment of tobacco for resale in Europe to make the voyage profitable. Minuit died on this voyage during a hurricane at St. Christopher in the Caribbean. The official duties of the first governor of New Sweden were carried out by Lieutenant (promoted to Captain) Måns Nilsson Kling, until a new governor was chosen and brought from Sweden two years later. Under Johan Björnsson Printz, governor from 1643 to 1653, the company expanded along the river from Fort Christina, establishing Fort Nya Elfsborg on the east bank of the Delaware near present-day Salem, New Jersey and Fort Nya Gothenborg on Tinicum Island (to the immediate southwest of today’s Philadelphia), where he also built his manor house, The Printzhof. The Swedish colony initially prospered. In 1644, New Sweden supported the Susquehannocks in their victory in a war against the English Province of Maryland. In May 1654, the Dutch Fort Casimir was captured by soldiers from the New Sweden colony led by governor Johan Risingh. Fort Casimir was renamed Fort Trinity (in Swedish, Trefaldigheten). Soon after Sweden opened the Second Northern War in the Baltic by attacking the Polish-Lithuanian Commonwealth, the Dutch moved to take advantage and an armed squadron of ships under the direction of Director-General Peter Stuyvesant seized New Sweden. The Dutch moved an army to the Delaware River in the summer of 1655, easily capturing Fort Trinity and Fort Christina. 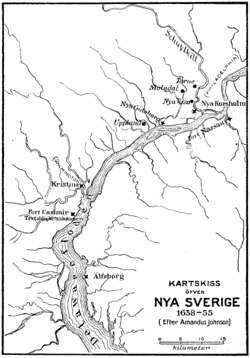 The Swedish settlement was incorporated into Dutch New Netherland on September 15, 1655. Initially, the Swedish and Finnish settlers continued to enjoy local autonomy, retaining their own militia, religion, court, and lands. This status lasted officially until the English conquest of the New Netherland colony was launched on June 24, 1664. The Duke of York sold the area that is today New Jersey to John Berkeley and George Carteret for a proprietary colony, separate from the projected New York. The actual invasion started on August 29, 1664, with the capture of New Amsterdam. The invasion concluded with the capture of Fort Casimir (New Castle, Delaware) in October 1664. The invasion was conducted at the start of the Second Anglo-Dutch War. The status continued unofficially until the area was included in William Penn’s charter for Pennsylvania, on August 24, 1682. During this later period some immigration and expansion continued. The first settlement at Wicaco, a Swedish settlers’ log blockhouse located below Society Hill, was built in present-day Philadelphia in 1669. It was later used as a church until about 1700, when Gloria Dei (Old Swedes’) Church of Philadelphia was built on the site. The signing of the Treaty of Westminster of 1674 ended the Dutch effort, and required them to return all of New Netherland to the English, including the three counties they created. That handover took place on June 29, 1674. After taking stock, the English declared on November 11, 1674, that settlements on the west side of the Delaware River and Delaware Bay (in present day Delaware and Pennsylvania) were to be dependent on the Colony of New York, including the three Counties. This declaration was followed on November 11 by a new declaration that renamed New Amstel as New Castle. The other counties retained their Dutch names for the duration. The next step in the assimilation of New Sweden into New York was the extension of the Duke’s laws into the region. This took place on September 22, 1676. This was followed by the partitioning of the Counties to conform to the borders of Pennsylvania and Delaware. The first move was to partition Upland between Delaware and Pennsylvania, with most of the Delaware portion going to New Castle County. This was accomplished on November 12, 1678. The remainder of Upland continued in place under the same name. On June 21, 1680, New Castle and Hoarkill Counties were partitioned to produce St. Jones County. 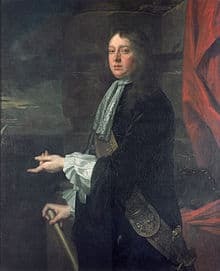 On August 24, 1682, the Duke of York transferred the western Delaware River region, including modern-day Delaware, to William Penn, thus transferring Deale and St. Jones from New York to Delaware. St. Jones County was renamed as Kent County; Deale County was renamed Sussex County; New Castle County retained its name. The historian H. Arnold Barton has suggested that the greatest significance of New Sweden was the strong and long-lasting interest in North America that the colony generated in Sweden. Major Swedish immigration to the United States did not occur until the late 19th century, however. From 1870 to 1910, over one million Swedes arrived, settling particularly in Minnesota and other states of the Upper Midwest (see Swedish American). Traces of New Sweden persist in the lower Delaware Valley to this day, including Holy Trinity Church in Wilmington, Gloria Dei Church in Philadelphia, and Trinity Episcopal Church in Swedesboro, New Jersey, all commonly known as “Old Swedes’ Church”. Christiana, Delaware, is one of the few settlements in the area with a Swedish name. Swedesford Road is still found in Chester and Montgomery Counties, Pennsylvania, although Swedesford has long since become Norristown. The American Swedish Historical Museum, located in FDR Park in South Philadelphia, houses many exhibits, documents and artifacts from the New Sweden colony. Perhaps the greatest contribution of New Sweden to the development of the New World is one that is not even thought of as Swedish. The colonists brought with them the log cabin, which became such an icon of the American frontier that it is thought of as an American structure. The C. A. Nothnagle Log House on Swedesboro-Paulsboro Road in Gibbstown, New Jersey, is one of the oldest surviving log houses in the United States. The colonists came from all over the Swedish realm. The percentage of the Finns in New Sweden grew especially towards the end of the colonization, comprising 22% of the population during Swedish rule, but rising to about 50% when the colony came under Dutch rule. The year 1664 saw the arrival of a contingent of 140 Finns. In 1655, when the ship Mercurius sailed to the colony 92 of the 106 passengers were listed as Finns. Memory of the early Finnish settlement lived on in place names near the Delaware River such as Finland (Marcus Hook), Torne, Lapland, Finns Point and Mullica. A portion of them were known as Forest Finns, people of Finnish descent living in the forest areas of Central Sweden. The Forest Finns had moved from Savonia in Eastern Finland to Dalarna, Bergslagen and other provinces in central Sweden during the late 16th and early to mid 17th centuries. Their relocation had started as part of an effort by Swedish king Gustav Vasa, to expand agriculture to these uninhabited parts of the country. The Finns in Savonia traditionally farmed with a slash-and-burn method which suited better for pioneering agriculture in vast forest areas. It is notable that this was the method used in farming by the native Indians of Delaware as well. * Fort Christina (1638) – located at the confluence of the Brandywine Creek and the Christina River in Wilmington, Delaware. * Fort Mecoponacka (1641) – located in Chester as a defense for the settlement then known as Finlandia, near Upland, Delaware County, Pennsylvania. * Fort Nya Gothenborg (1643) – located on Tinicum Island near the site of The Printzhof in Essington, Pennsylvania. * Fort Nya Vasa (1646) – located at Kingsessing, on the eastern side of Cobbs Creek near Cobbs Creek Parkway and Greenway Avenue in Philadelphia, Pennsylvania. * Fort Nya Korsholm (1647) – located at the mouth of the Schuylkill River, probably on Province Island, near the western approach of the Penrose Avenue Bridge in Philadelphia. * Fort Casimir (1654) – also known as Fort Trinity (in Swedish, Trefaldigheten), located at the end of Chestnut Street near Harmony & 2nd streets in New Castle, Delaware.